In the 1960s, tankers and bulk carriers were taken off the stock of Deutsche Seereederei and formed an own, thought short lived, company. In 1974, both companies merged back again, from then on using the name VEB Deutfracht/Seereederei, the abbreviation DSR and the old DSR flag. Flag: the blue-red-blue DSR-design [without the blue fly stripe], in center a yellow griffin-like image, referring to the company's home port Rostock. 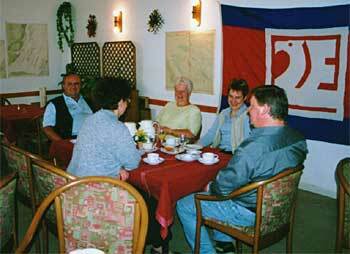 This photograph shows the first flag of the DSR [in fact VEB Deutfracht? ].